About three weeks ago, I decided to go a month without sugar to see how my body reacts/changes and improves. Now, there are 2 exceptions to this rule, which I honestly cannot change. 1. Since I take orders, I have to taste the baked goods before sending them out. Its called quality control guys. I promise, just an itty bitty bite. 2. Two spoons of sugar in my coffee, which is just a couple times a week. I’m on already day 26! Though I had serious doubts at Week 1 if I would be able to get through an entire month. Finishing dinner without a sweet treat was just painful and I had to rely heavily on hubby during my moments of weakness (a moment was really a few hours each night). I’m almost done and have learned to control my impulsive sugar cravings. Just last night, Chirag enjoyed an ice-cream sandwich while we were watching Harry Potter and I didn’t even ask for a bite! I deserve a medal for that. Yay me! I started testing out a few easy recipes to somewhat satisfy those cravings, but honestly speaking, the one and only thing that truly helped was sipping water all day. I noticed that I ate more sugar while snooping around the kitchen in search of a snack. As I drank more water, my need to 'munch' was curbed significantly. Below are two quick and healthy recipes if you need a substitute for sugar. 1. Take a cup of Vanilla Greek yogurt and spread it with a spatula on a pan covered in foil. 2. Cut up fruit or other crunchy toppings and freeze for a few hours. Break them up and continue storing in the freezer. Grab a piece during the day! 2. 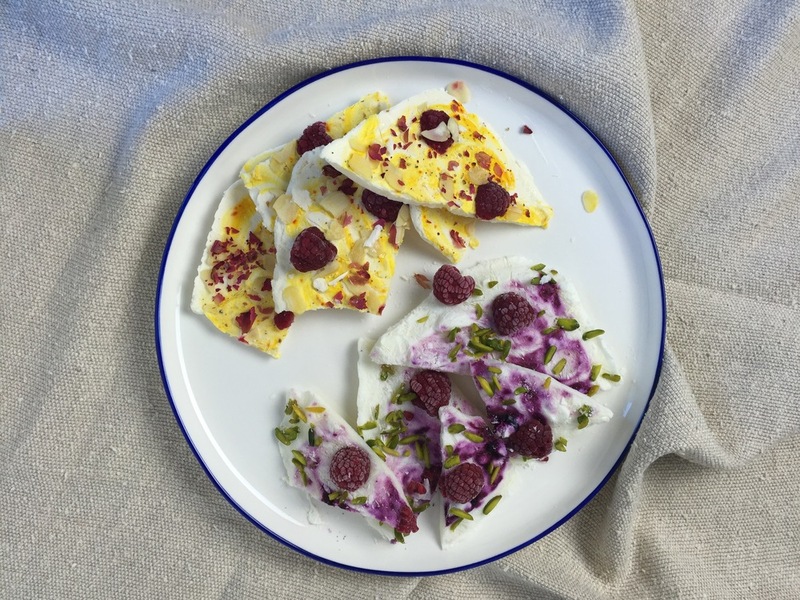 Vanilla Greek yogurt, Raspberries, Saffron, Cardamom, Almonds, Pistachios & Rose Petals. 1. Slice bananas up in thin rounds, and freeze them for an hour. 2. Take dark chocolate with at least 70% cocoa content and melt it in a double boiler. 3.Once the bananas are frozen, dip them in the melted chocolate and immediately roll them in crushed peanuts, or any other nut. 4.Freeze again and snack on them whenever you like! Despite all of this, I still strongly believe in enjoying food, healthy or unhealthy (Yolo?). Dessert will always and forever be a big part of my life. I believe in the decadent ooey-gooey chocolate cakes, freshly baked cookies, and those incredible plated desserts with passion fruit foam. At the end of the day, if you’re going to eat dessert, do it right. Just don’t have it for breakfast, lunch and dinner, or as an impulse. Dessert should be savored and enjoyed. Not eaten mindlessly and never resulting in guilt.